WASHINGTON, Mar 19, 2009 (UPI via COMTEX) -- From Atlantic beaches to Midwestern prairies and Hawaiian forests, one-third of the 800 U.S. bird species are in danger, a report released Thursday said. "The U.S. State of the Birds" is based on data from three bird censuses, including the annual Christmas bird count organized by the Audubon Society, Interior Secretary Ken Salazar said. "Just as they were when Rachel Carson published Silent Spring nearly 50 years ago, birds today are a bellwether of the health of land, water and ecosystems," Salazar said. "From shorebirds in New England to warblers in Michigan to songbirds in Hawaii, we are seeing disturbing downward population trends that should set off environmental alarm bells." Bird ranges have shifted progressively northward over the last 40 years. The Audubon Society has controversially linked this shift to climate change. "Center of abundance" refers to density. Chicago residents discover their feathered neighbors. Recent media coverage of Audubon's finding has missed the point, said Libby Hill, a vice president of the Evanston North Shore Bird Club. To accurately convey the report's findings, Medill Reports asked Judy Pollock, director of bird conservation for Audubon Chicago Region, to straighten out these misconceptions. More than 60 different bird species exchanged their current winter ranges -- the areas they settle in during colder months -- for new ones more than 100 miles north. Hummingbird family photos They are coming to Songbird Prairie approx May 1st Make your reservation today! One of my favorite arrivals is that of the Ruby-throated Hummingbird. Even non-birders talk excitedly about the first hummingbird sighting. In case you didn't know, there is a really great hummingbird migration map. You can use the map to report a sighting or to follow the migration. Once they approach your area, get out those feeders and make your nectar. Although snowflakes still could fall, it's time to get ready for the hummingbirds. An old wives tale states: "When the first red flowers bloom the hummingbird will be returning soon" -- usually around the middle of April when red and pink azaleas are first blooming. In central Ohio and Northwest Indiana two species of hummingbirds visit feeders. The commonest is the ruby-throated hummingbird. Although both sexes are iridescent green, the male has a black throat patch that reflects bright ruby red in sunlight. The juvenile looks like the plain female. They are about three inches long and weigh only two to three grams. A rarer sighting in Ohio is the rufous hummingbird. This species is native to the Northwest United States, from California to Alaska. It likely is to show up at a feeder in September or October. The male has an iridescent red throat and non-shiny reddish brown back. His tail is orange with black tips. The female has a white throat with a few red feathers. Her tail is orange, green and black with white tips. The rufous is aggressive at feeders although it is slightly larger than the ruby-throated. Hummingbirds will return to areas where feeders had been placed the year before. Many of the available feeders are red and will have several ports for feeding. If trees or shrubs are near a feeder, the birds will rest there between feeding. A simple solution of sugar and water can be used to fill the feeder. The formula is one part sugar dissolved in four parts boiling water, boil for 2 minutes and cool. Don't add red food coloring because it can harm the birds' organs. Hummingbirds are enjoyable to watch at the feeder. There is usually the most activity early in the morning and late evening. Increased activity also has been observed before thunderstorms. 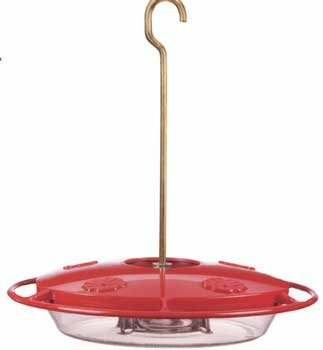 Hang several feeders near your windows and enjoy the summer treat. Hummingbird gardens planted to attract the birds also will attract butterflies. A diverse mix of annuals, perennials, vines, shrubs and trees works best. The annuals provide quick color and nectar. The perennials shrubs and trees will bring the birds back year after year. The annuals can include fuchsia, lantana, four-o'clocks and nicotiana. Bee balm, columbine, hollyhocks and cardinal flower are a few of the perennials that will attract the birds. Trumpet vine, butterfly bush, Rose of Sharon and weigela would make attractive additions. Choose plants with bright colors that grow at various heights. A hummingbird needs about 1,000 blooms each day to survive. So the addition of a feeder near the garden will assure a plentiful food source. Margaret Graft is a Master Gardener volunteer. Barbara from Songbird Prairie is also a Master Gardener! How to become a birdwatcher Monday, 09 March 2009 by Joni Astrup Associate editor Like watching birds out your window or at a nearby birding hotspot? You’re not alone. Nearly 48 million Americans enjoy watching birds, according to a 2006 federal study. One of them is Nancy Haugen, who began birdwatching in college when she took an ornithology class. “It’s enjoyable,” said Haugen, who now works as the visitor services manager at Sherburne National Wildlife Refuge near Zimmerman. Wondering how to begin birdwatching? Here are some suggestions from Haugen. Put up a feeder “The No. 1 thing to do is to install a bird feeder at your home within view of a window,” advises Haugen. The feeder should be in an open area where squirrels can’t jump to it from a branch. However, it also should be 15–20 feet from shrubs or trees so birds have cover to protect them from predators. Haugen recommends filling the feeder with black-oil sunflower seeds. “They are just an all-time favorite for birds and they’re healthy,” she said. In addition, during the winter you also may want to put out suet, which attracts woodpeckers. In the summer, a nectar feeder is a draw for hummingbirds. Buy binoculars The next thing to consider is buying a pair of binoculars. Haugen recommends a basic pair, 8×50 power. She suggests looking for a pair priced in the $50 to $100 range. Start using the binoculars to watch birds coming to the backyard feeder. Also look for birds in the trees and bushes around the feeder. After buying binoculars, it’s a good idea to get a field guide to birds. These books are designed to help people figure out what types of birds they are seeing. Haugen said there are many different field guides available. Join a birding group Once you are used to the binoculars and are ready to observe birds away from home, Haugen suggests joining a birdwatching group. “When you get together with other birders, many eyes see more birds, many ears hear more birds,” she said. Birding at the refuge A total of 232 species of birds have been recorded on the refuge, Haugen said. Some nest there and others pass through. One good place to view birds is on the refuge’s wildlife drive, a 7.3-mile loop that begins off County Road 5, one mile north of Orrock. The drive is closed for the season now, but will reopen this spring. No date has been set but Haugen said it typically opens in late April. The exact date depends on a pair of bald eagles that nests along the drive. If eggs are laid, the refuge waits at least a week after the eaglets hatch to open the drive. Haugen said the wildlife drive is excellent for birdwatching because it has a variety of habitats — woods, wetlands and prairie. “Different birds use different habitats so you expand the number of birds that you’re going to have a chance to see,” she explained. Haugen said the best times to look for birds is just after dawn until 10 or 11 a.m. and from 6 p.m. to dark. Birds are active in the morning because they are hungry. They are active in the evening because they feed before roosting for the night. In midday, they find shelter from the heat, she said. Spring, meanwhile, is one of the best times to be birdwatching. Then not only are many birds returning to this area after spending the winter elsewhere, but other birds are passing through on their way north to nest. That gives people a wider variety of birds to observe, Haugen said. Many warblers, for instance, usually migrate through this area around the second and third weeks of May, she said. Birds that are returning to Minnesota in the spring are ready to mate and lay eggs. “The males are setting up territories and trying to attract females, so you hear a lot of birds singing in the springtime,” she said. Learning to identify birds by their songs is another level of bird watching, she said. CDs of bird calls are available in the nature section of book stores. ——————————————————————————– Paul Gunderson, a science teacher at Elk River High School, offers these tips for birders: Binoculars: “Birders need a good pair of binoculars with eight or 10 power magnification (I prefer 10),” he said. “Select a pair with a wide field of view.” In addition to the binoculars, Gunderson highly recommends a spotting scope and a sturdy tripod. “Birds such as waterfowl and shorebirds are often viewed from long distances and the extra power of the scope allows you to see more detail. A scope will add a whole new dimension to your birding,” he said. Field guides: There are many good field guides available, Gunderson said. “The one I use most is ‘The Sibley Guide to Birds,’” he said. “It covers all of North America but is fairly large for a field guide. The smaller-sized ‘Sibley Field Guide to the Birds of Eastern North America’ is also pretty good. I also use the National Geographic and Peterson guides.” CD set: Gunderson said new birders may want to pick up “Stokes Field Guide to Bird Songs: Eastern Region.” It is a three CD set with recordings of songs and calls of most of the birds found in the eastern United States. There is a western United States set as well. National Geographic makes a set, too. Bird lists: Many birders keep bird lists. These lists can be by state, county, year or even a yard list. “My yard list for a one-year period may contain up to 125 species. Most birders also keep a life list,” he said. Good places to go birdwatching: •Sherburne National Wildlife Refuge, located near Zimmerman: He said it’s one of the best places in the Elk River area for birding. It has woodland, grassland and wetland habitats. “The Blue Hill Trail on the refuge has a variety of warblers including resident mourning and blue-winged warblers.On the Mahnomen Trail you may spot black-and-white warblers, and both yellow-billed and black-billed cuckoos. Both trails are good for spring migrant songbirds.” On the refuge’s wildlife drive Gunderson said people may observe waterfowl (especially during spring migration), eagles, hawks, many species of sparrows, orchard and Baltimore orioles, sedge and marsh wrens and trumpeter swans. “You may also see and hear sandhill cranes — one of the loudest North American birds,” he said. On the Woodland Loop hiking trail on the wildlife drive he said to look for the scarlet tanager, blue-gray gnatcatcher and, if you’re lucky; a red-headed woodpecker. •Lake Maria State Park, located west of Monticello: It’s the only place he’s aware of close to the Elk River area where people may find cerulean warblers. •Crow-Hassan Park Reserve, located west of Rogers: “Crow-Hassan Park Reserve is loaded with bobolinks and a variety of sparrows as well as hawks. Planting For That Touch Of Beauty. Find plants shrubs and trees with songbirds entertaining you in them at Songbird Prairie B & B.
America is pet with a avid variety of plants that crapper be used to find our surround more pleasing. America is pet with a avid variety of plants that crapper be used to find our surround more pleasing. Outdoor warning crapper be heavy or created by planting trees, shrubs, and added plants that impact grandiloquent flowers, colourful leaves or berries, or symptomatic forms. When used in combinations, they ofttimes pass revelation holding as, for instance, in placing anthesis shrubs against taller scene trees, or multifarious the essay of a activity to remuneration flow flowers and move colors. Freshly hierarchal or cold slopes along anchorage and trails are secure and their attending improved when grasses, wildflowers, or vines are sown. Not inner do plantings add a occurrence of warning to a post but they entertainer songbirds and added wildlife. TREES FOR BEAUTY AND COVER The dogwoods. It grows meliorate on reddened soils than on heavy soils and seldom occurs on poorly evacuated soils. Litter from cornel is dowse in minerals, good to trees and added plants. Dogwood grows up to 40 feet tall and 12 inches in diameter. It grows apace for 20 to 30 eld but noise tardily thereafter. Dogwood is easily injured by wind and is hypersensitised to drought.